The ancient oaks in Token-Oak are dying . . . but the drug business is booming. Token-Oak, once a spiritual stronghold for the Plains Indians, is overrun by drugs. The same drugs that, years ago, destroyed Robert Warrington’s childhood and left him with an unrelenting desire to protect others from similar suffering. After spending years studying the causes of addiction in a government-run laboratory research project, Warrington becomes disillusioned. As he watches two drug epidemics—methamphetamine and opioids—swallow America, he discovers that Token-Oak’s dead oak trees and townspeople have long been the victims of the largest human field study in American history. The drug crisis in Token-Oak that claimed the lives of his parents goes far deeper than he could have ever imagined. The Hollows northeast of Token-Oak, long abandoned by local police, is a hotbed of meth labs and murders. The government field study has spawned a new breed of addicts that have been collecting in the Hollows. The town of Token-Oak is at the epicenter of an unstoppable violence that is about to sweep across the nation through hidden drug networks and small towns. With the government unable to stop what it started, and the danger increasing by the day, Warrington must find a way to face what’s coming, save his family, and confront the evil of the Hollows. The first book in S.D. 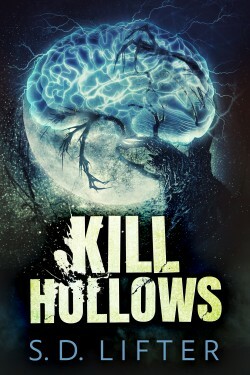 Lifter’s Token-Oak series, Kill Hollows is a dark and violent thriller that will keep you breathless until the shocking conclusion.